"These are tasty alternatives to both regular french fries and also a way to get in your veggies! I make them by the truckload and freeze them. My husband hates green beans but gobbles these up! 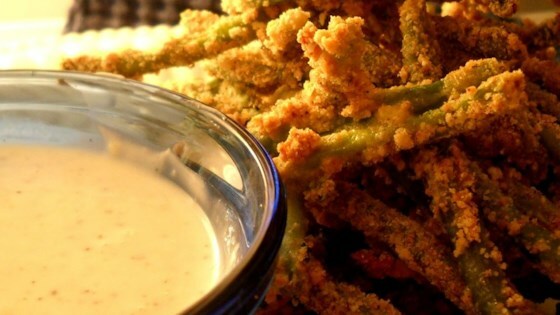 Serve with Ranch dressing or another favorite dipping sauce." Heat the oil in a deep fryer or electric skillet to 375 degrees F (190 degrees C). Combine the green beans and water in a saucepan. Cover and bring to a boil. Cook until the beans are bright green, about 4 minutes. Drain and transfer to a bowl. Cover with cold water and set aside. In one bowl, whisk the egg and milk together. In a separate bowl, mix together the bread crumbs, chili powder, garlic powder, and onion powder. Drain the green beans and toss with flour to coat, shaking off the excess. Dip the beans into the egg mixture and then into the bread crumbs, coating thoroughly. Fry beans in batches so they are not touching. Cook until golden brown and crispy, about 2 minutes. Drain on paper towels. To cut down on oil in the beans I only fry for 1 minute and then put them in a dry frying pan to finish crisping up, it takes longer but it makes it a bit less oily. Great recipe. I also ommitted the pre cooking step. I actually used frozen whole green beans unthawed. Still turned out awesome. This is a keeper. These were awesome! I made cucumber and wasabi dip like they make at TGIFridays to go with them.